Aging often brings concerns about health, worries about finances, and frustrations about change. The so-called golden years can seem filled with loneliness and pain. How is a person of faith to cope with the challenges and find purpose for the rest of his or her life? Missy Buchanan encourages older adults to maintain open dialogue with God. Through a series of personal poems and reflections, each coupled with a selection from Psalms, Buchanan presents heartfelt talks with God. She addresses topics such as the fear of falling, despair over feeling useless, and grief after the loss of a spouse. 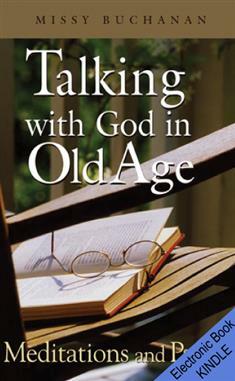 For professionals, friends, or family members seeking to understand an aging loved one, Talking with God in Old Age offers a glimpse into the thoughts and emotions of someone who speaks with candor and from experience. For seniors currently grappling with the aging process themselves, this book can serve as a daily devotional with a friend who is "in the same place." Readers can join Missy Buchanan on the journey of faith as she shares with honesty both the heartaches and concerns of the elderly persons she has interacted with on a daily basis and the hope they reveal in old age.